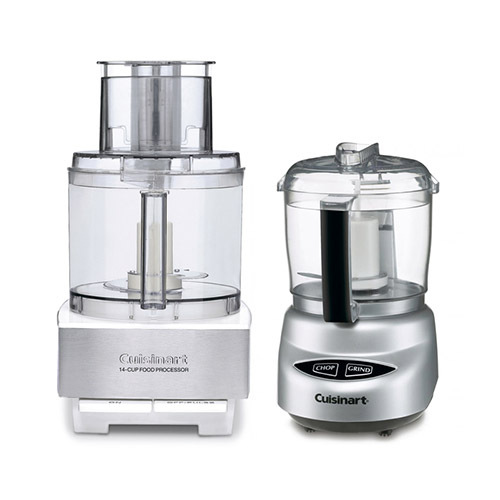 The Cuisinart DFP-14BCWNY /CSNRT-DLC-2ABC is a combination of 14 Cup Food Processor and Mini-Prep Plus Processor Kit. The Cuisinart DFP-14BCWNY is made from sleek brushed stainless steel, this sleek kitchen workhorse is a breeze to use and will whir through prep and cooking with ease. Whether you are making a weeknight meal or a weekend celebration, the large capacity work bowl will hold everything as the 720watt motor makes quick work chopping whole fruits and vegetables, shredding cheese, or kneading dough. The Cuisinart DLC-2ABC Mini-Prep Plus Processor is an ideal appliance for pesto making, salad dressing, chopping and grinding. Its versatility lies in the special auto reversing Smart Blade8482;, which makes it easier to process both soft and hard foods. The processor features a sleek touch pad controls, elegant looks and easy to clean dish washer safe parts. The 14 Cup Food Processor & Mini-Prep Plus Processor Kit has many exciting features for users of all types. See the 14 Cup Food Processor & Mini-Prep Plus Processor Kit gallery images above for more product views. 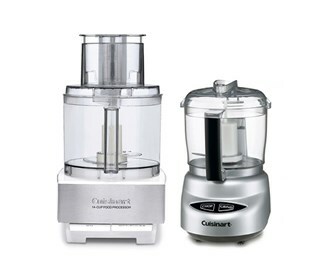 The 14 Cup Food Processor & Mini-Prep Plus Processor Kit is sold as a Brand New Unopened Item.